Himalaya Herbal Healthcare MenoCare is an herbal formula that provides women physical and emotional support during menopause and alleviates their problematic symptoms. It aids normal hormone utilization and helps maintain hormone balance in the body. It also reduces mood swings, irritability, tiredness, anxiety, stress and sleeplessness. MenoCare also keeps the urinary tract healthy. This supplement does not contain Black Cohosh, which a popular ingredient in menopause supplements but has been found to have adverse effects on the body. Asoka tree (bark): Has estrogen-like properties, which treats menopausal symptoms, strengthens uterine muscles and reduces menopausal and menstrual pain. Shatavari (root): Reduces hot flashes, vaginal atrophy and other menopausal symptoms. Sharpens the mind and restores energy levels. It also reduces physical and mental stress and is used in Ayurveda as a sexual tonic. Chebulic myrobalan (fruit rind): Reduces nervousness, irritability and acts as a tonic to keep the digestive system healthy. Heart-leaf sida (root): Promotes energy and sexual wellbeing. Licorice (root): Has estrogenic properties and helps reduce symptoms of menopause. Gotu kola (whole plant): Improves mood, energy levels and also mental acuity. Ideal dosage is 1 or 2 capsules twice a day with meals. Does It Have Long-Term Benefits? This product has progressive but long-term benefits. It is a natural product and does not have any major side effect. Some people may experience upset stomachs, but the supplement does not cause any serious problems. Price per bottle containing 120 capsules is around $18.69. Depending on the dosage you are taking, one bottle can last between 1 to 2 months, so averaging that, effective monthly cost is $12.46. The company offers a 30-day refund policy. However, they issue a full money back refund for unopened products and store credit for opened or used products. This is an ayurvedic supplement made from herbal ingredients used in ancient medicine. It is quite cost effective, almost half the price of popular menopause supplements. 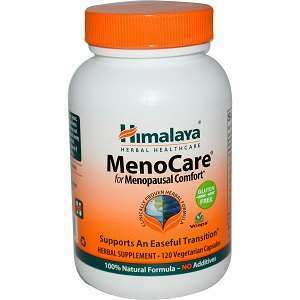 Jackie Horowitz	reviewed Himalaya Herbal Healthcare MenoCare	on October 21st	 and gave it a rating of 2.